This kale salad recipe is a tasty and healthy way to get in those dark leafy greens that are so good for your health. Tossed in an irresistible maple-mustard dressing, this is one salad you’ll be excited about eating! 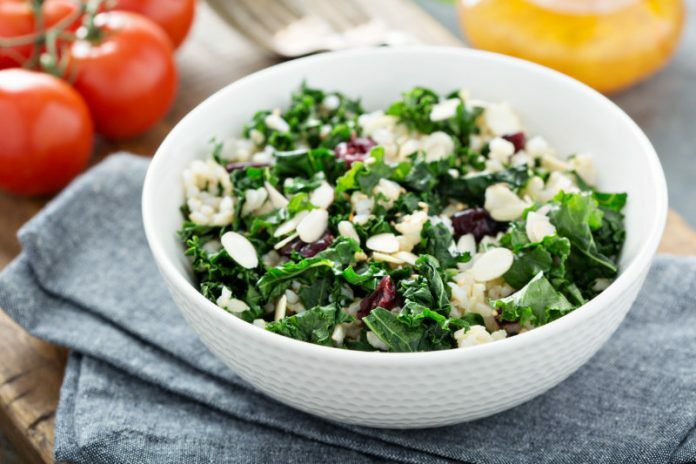 To create this kale salad recipe, you can use whatever type of kale you prefer, however, we use Tuscan kale. The type of kale you use isn’t as important as how you prepare the kale. We suggest cutting the kale up into fine ribbons as kale can be a bit tough to chew on when it’s served in large pieces. The maple-mustard dressing for this kale salad is both sweet from the pure maple syrup and slightly spicy thanks to the dose of Dijon mustard. We like that maple syrup is used as a natural sweetener for this dressing rather than table sugar like many store-bought salad dressings. You can toss in whatever vegetables you like into this salad, but some of our favorites include chopped broccoli florets, julienned carrots, and shaved Brussels sprouts. We also like pairing this salad with fruit and often include apples and dried cranberries, as showcased here. Nuts like chopped walnuts, pistachios, and shaved almonds make for a tasty, crunchy garnish. If you want to make this kale salad an entrée, we recommend serving the salad with grilled or baked salmon. Otherwise, we recommend serving the salad as an appetizer or side. Add the walnut halves, balsamic, maple syrup, 1 tbsp of olive oil, and the dijon mustard to the bowl of a food processor. Add 2 tablespoons of water and a pinch of salt and pepper. Pulse until smooth. Add more water and seasoning, as desired, to thin out consistency. Toss the apples with the lemon juice in a large salad bowl. Add the shredded kale, cranberries, and the dressing. Toss everything to combine. Garnish with shaved almonds.